I’m not ready to put Portland behind me. Not yet. Maybe because it’s simply out West, but there is something about Portland. 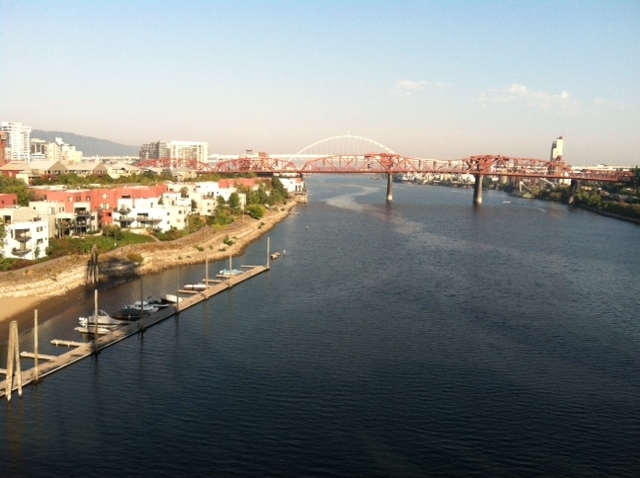 The Willamette flows into the Columbia at Portland and splits the city in two. The river is a good focal point. The priority items in last week’s letter (and rightfully so) didn’t leave me enough space to praise that city to Ellen and Reid. Not that I want them moving further away from me than they already are, but the popularity of Oregon, and Portland in particular, are such that they advertise for visitors as long as they don’t become residents. The City of Roses (that moniker is even stamped on their manhole covers) seems to have traits of all good cities: attractive, lively, great food, good architecture, and very habitable. Where cities like Charlotte should pay attention is another common denominator: effective and widespread mass transit. The light rail strings the city together, from the airport to the city center and the ‘burbs beyond. Charlotte could borrow a page from Portland. 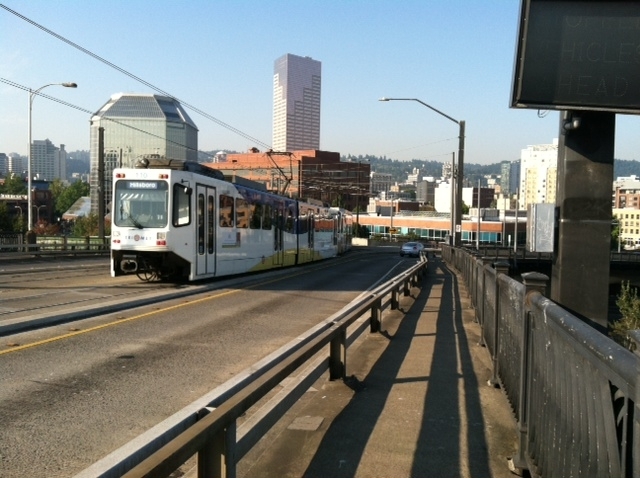 A wonderful light rail system ties the city together, with noticeably less motor traffic. I wouldn’t dream of pedaling around Charlotte. Bikers here are an afterthought if not a nuisance and the news of car-inflicted injuries on the narrow ‘bike lanes’ here are all too common. In Portland though, the bike lanes are spacious and biking to work and play is the norm; Minneapolis and Portland square off in a running (biking?) argument as to which is the more biking-est city. On a year ’round basis, Portland has to get the nod. The one disappointing thing was the cleanliness. The streets were trashy and not picked up to the extent a visitor would hope to see. If I was to grade Portland, it would get a B- if only because they make a concerted effort to get the locals to recycle. Bins to separate waste are a great idea. 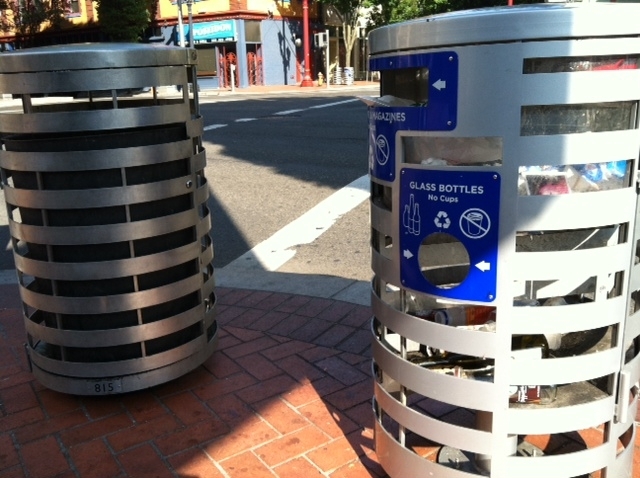 Street corner bins allow walkers to separate recyclable waste. Unfortunately, walkers could go a few feet left or right to find enough litter to fill these containers. Finally, Portland has Powell’s Bookstore. Best brick-and-mortar bookstore. Ever. Now I’m done with Portland. Here is what E & R received a couple of weeks ago. Ellen/Reid: I head out to Portland on Thursday morning and get in about 2:30 local time. My lodgings are a C (or D) grade joint in the downtown near to the church and where Henry and Mary lived, and that’s good enough for me. Tom mentioned staying with them at their home in Eugene, but my thinking is his and the family’s plate is full enough without having to worry about guests. So I feel better about the arrangements. Tom bumped me the obituary this weekend, and today I’ll place it in the Omaha paper so those in Henry’s hometown can be brought up to speed on things. They sound relatively at peace with things, and Tom says the passing was calm and serene, all things considered. I’m looking forward to it. There’s a family gathering Friday night, and on Thursday night my nephew Eli addresses a crowd at a Patagonia store about his exploits paddling the Pacific coast. Patagonia is one of his sponsors, so that’s a bonus of sorts. The weekend was pretty quiet. Friday night, and for the first time in more than four years, Felicia cooked and it was delicious which caused me to raise the issue ‘why haven’t you done this more often?’ We went out and had a couple of drinks and heard some passable live music at Mac’s. Our intent was to ride to Shelby on Saturday night for reputed excellent BBQ (is chopped meat really BBQ?) but got rained out. Instead, we grilled a couple of beefy New York strips while we watched Nebraska stumble badly against a so-so UCLA team. The best days for the Big Red appear to be behind them. We also dog-sat her daughter’s lab/Weimaraner mix. It’s a sweet dog. Walked a couple of courses and played shoddy golf for the most part but the walking part was enjoyable. My best days at golf also appear to be well behind me. I do have the 12 page Caldwell newsletter to crank out in the next couple of days before heading West. Nothing – zero – is on paper as of this writing. That’s always a work in progress that comes together at the 11th hour or the last second, whichever comes first. Just when there appears to be no news, there is always some sort of divine intervention because a cover story or some other substantive item always pops up. John seems to appreciate it (Reid, you’ve not met him) and that’s sort of what keeps me going on it. This will be my 46th or 47th issue although no one is really counting. John’s starting to preach on the plight of the poor, and given that neither party really addressed the issue at their recent conventions, it is timely. I’m starting to sound like a church goer. Ellen, I’ll make t-day reservations this week, and Reid, we need to move off the snide to get your Christmas tickets too. Be sure to give me the dates on when you want to arrive and depart. I’ll try to secure us a place on the beach somewhere, possibly Oak Island. It’s about four hours due East of here. It will spare you having to look at nothing under the Christmas tree, and maybe we can cook like we did on that Thanksgiving at Hilton Head a few years back if we are fortunate enough to have a kitchenette. That was enormous fun. Of course, it will be December and you never know what the weather will hold. That’s okay. You’re from Chicago. Even the 30’s would be an upgrade for you. Here I was all set to think about retirement at 64 or 65 – and then I logged onto the Social Security website and found, to my dismay, that the retirement age is now 66. Bummer. I was all set to do something else with the rest of my life, like write or play more bad golf. I wouldn’t mind a part-time gig at a sporting goods store or something like that. I don’t think I’m cut out to be a barista since I loathe coffees that involve foam, milk, soy products, and other ersatz flavor enhancers. All that stuff is bogus and gets in the way of a good cup o’ joe. When Emma’s old enough for coffee, her Gramps will teach her what’s right and wrong. The central purpose to funerals and memorial services goes without saying. This past weekend in Portland we remembered and honored my uncle Henry. It was a wonderful, uplifting, spiritual and touching experience spread over several days. 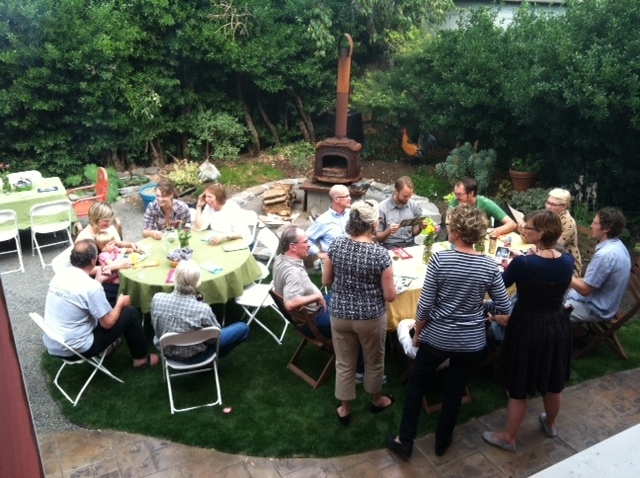 But these sorts of gatherings are secondarily a catalyst to bring extended families together. A forced family reunion if you will. It is sometimes a good thing and sometimes maybe not. My experience in Portland this past weekend clearly embraced the former. The Andersen’s extended family used Henry’s weekend as a chance to recall their father/grandfather/uncle, but also to catch up after years of being apart. Truly, it was a gathering of Henry’s generations. There was much happiness in remembrance. I’ve broken, yet again, the cardinal rule of posting a letter ahead of Ellen and Reid reading it, but in this instance time is of the essence. I’m sure they’ll understand. Here is the letter that will likely arrive at their homes today. Ellen/Reid: It was a good few days in Portland. The memorial service was well done (Henry outlined the service in its entirety) and it was great to be around the rest of the Andersen clan both before and after the service. They handled the entire extended weekend about as well as could be done. Aunt Mary acquitted herself as you might expect, with grace and still more grace. Her family group did believe, and that as Hank had preached, that there was something better awaiting him and most certainly a higher calling. So things went swimmingly in that regard. They were glad to see us cousins there, and we tried to stay out of the way as best we could. The early highlight was your cousin once removed, Eli. He had fashioned a lengthy surfboard out of cedar, and proceeded climb aboard it to paddle – by hand, no oars – the length of the western side of Vancouver Island which is not quite 400 miles. Even one mile in the Pacific on a wooden board knowing that there are creatures swimming below us who could just as easily chow down on hapless boarders would be too much for the lot of us. 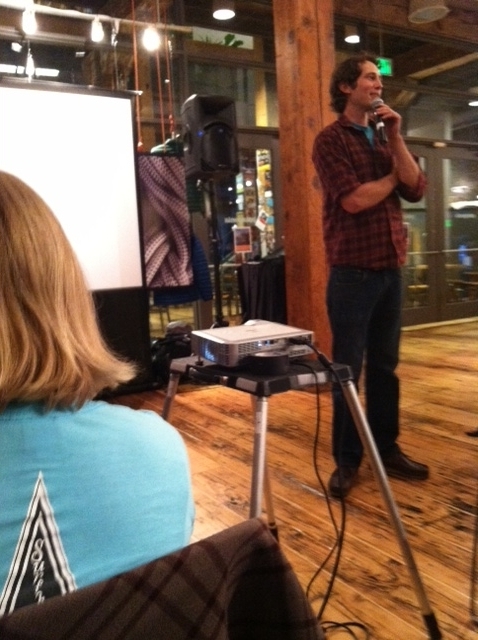 He gave a talk on his adventure at a local Patagonia store in downtown Portland on Thursday night, and it was well attended. Patagonia is a sponsor of Eli and there was, as someone in the family said, a small ‘shrine’ to Eli in the store including photos and the actual board dangling ahead. It was quite inspirational. Eli exists for that very kind of thing and this was just another chapter in his saga. He’s gone across the U.S. on bike with his dad, Tom and brother Ben, built yet other boards, and paddled other salt waters along the Pacific coast. Eli eloquently recalled his solo paddle (on a cedar surfboard of his own making) down the nearly 400 miles of Vancouver Island’s west shore for an enthused audience at a Portland Patagonia store. Eli’s independent, adventurous streak mirrors that of his siblings, his parents – and his grandfather. Ralph and Gayle arrived Thursday, and that night we went up to Ben’s home where we ate broiled chicken and other good foods. The highlight was an audio tape that Tom’s wife, Jessica (a really good book and magazine writer) had recorded of Henry a few years back describing the Christmas Eve sinking of the Leopoldville, a World War II troop ship sunk by the Nazis that claimed about 750 – 1,000 lives. Henry was one of the handful up on deck who survived because they were there to sing carols when the torpedoes slammed into the hull. His account was riveting, in part because it was already dark outside when the tape started, and he retold the story so well. It was good for the family to hear that. The family assembled a couple of other times aside from the service. We convened Saturday after the service for lunch at the church and later that day for a relaxed reception on the penthouse floor where Mary lives. We had a meal there, too, but before that some of us took a side trip to have the best tacos I have ever eaten. It was at a seedy joint named Robo-Taco, and they were just incredible. There was a funny moment during the post-service reception at Mary’s place. Henry was cremated, and they returned the ashes to the family, but they returned other non-burnable items in a clear plastic bag, too, such as Henry’s replacement knees. We all tried to guess how the knees worked – Ben took them out of the bag – in a scene that Tim described as macabre. It was a good moment of levity. So the family took things very much in stride, and we would not have missed it. I hoofed it around Portland a fair amount in part because my hotel, the vaunted Inn at Convention Center, was a total fleabag/dump. But otherwise it is a great town. High emphasis on mass transit and a great light rail service that covers much of the metro area. Tons and tons of bike riders (the pedal kind of bikes). The weather was divine and conducive to hoofing it. But I’m glad to be home now. A few hundred work emails will grab your attention, so I am back at the entrance to the salt mines. Pretty soon I’ll be fully immersed in it. A dichotomy was at work within the family in the last week. It turns out both are celebrations of differing times of life. My uncle, Henry Andersen, a renown Presbyterian minister and one of those uncles that you could really get to like, passed away on Labor Day. This coming weekend his children and other relatives, admirers and past congregants gather in Portland, Oregon to celebrate Hank and all that he meant to whole generations of people. Then there’s Emma. The celebration around this little wonder started in May and shows no signs of stopping yet. 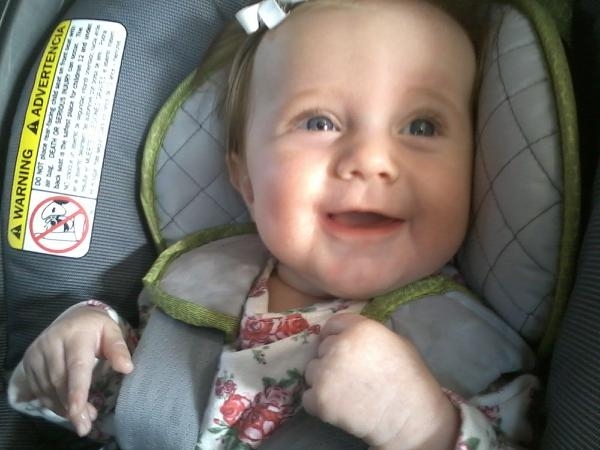 Emma is ready and rarin’ to go the Minnesota State Fair with mom and dad. She giggles at peek-a-boo, tries ever so hard to talk, and is a jolt of household energy (even if she insists on playtime during Ellen’s supposed off-hours between midnight and 5 a.m.). One dedicated, fruitful life of service draws to a close while another enters the fifth month of her new adventure. Getting on with life, it seems. Ellen/Reid: It’s tough deal with my uncle Henry but in other ways a good thing in that whatever suffering he experienced was over. He was just a plain and simple good guy. Lived his life as he preached it. You would suppose that might make things easier for his family but it never is. He was always fair and decent and we always seemed to get along pretty well. It is amazing how fast things can turn; healthy and vibrant one moment, then the precipitous fall. But Tom said things were peaceful at the end. Henry had been under hospice care for only four days, and in some ways that is a blessing. Even in his state, Henry was insistent on coming down to see both your grandparents in their failing moments. Your uncle and I will go to Portland. I will head out Thursday the 13th. Not sure when Ralph will make it. Probably about that time, too. Mary was an absolute rock through all of this. She handled it very gracefully and was a pillar of strength. I’m glad you both had a chance to experience Henry in the last couple of years. The Democratic convention is in town. As much as I’d like to get downtown (or Uptown as the locals call it) for some of the action I will more than likely stay at home and watch on TV and read the paper. That’s a little too much activity for this guy not to mention all the security. We walked the golf course yesterday and saw the big military grade helicopters doing their thing very close to the course. Some sort of dress rehearsal. I like that the convention is here; good for the city and state although the GOP’s self-described “attack” troops are in town, too. It’s a good thing they don’t call them “Truth Squads” since that would be stretching it a bit. Reid, I’d go with your mom’s Calphalon. That is pretty good cookware and will more than get you and Liz by in your squeezed little space. You have to be able to cook and every meal in will save you money and increase your together time by that much more. Food prep is a fairly social time and there’s nothing wrong with that. We rode to breakfast yesterday morning to a little dive across the border in South Carolina, and there was a table of adults and kids a few feet away. Three of the adults and two of the kids were on their mobile devices. It’s whack if you ask me. The art of conversation takes a nose dive when you see that happening – but Felicia and I both check our ‘smart’ phones when we’re out. I’m going in tonight to an after-hours orthopedic place to get my right elbow checked out. It just hasn’t been right since it got smacked in Wyoming and continues to be puffy and very sore. They may have to drain it. It’s hard to place my elbow on a table, it is that sore. I don’t know what the hell happened. I didn’t realize backpacking was such a contact sport. We went to a post-Bridger reunion the other night with Tom and Richard and it was great seeing all the photos and reliving the perilous moments (i.e. eating overcooked or distinctly non-flavorful food, blisters and other assorted ow-ies, etc.). Ellen, I love how Emma is displaying her personality. She is going to be a handful. She is working so hard to talk. Once she finds her vocabulary, her babbling will be non-stop so watch out. Nothing wrong with that, however. I’ll have to change my screensaver with one of the new updated shots of her smiling and trying to talk. Wish I could see the little charmer more often. Okay, enough already. Keep the text messages coming, and the photos, too. Reid, send me some solid dates for Christmas, and I will get your ticket. Just don’t’ expect it to be First Class. Not that you will ever see it dropped in this space, but the F-bomb has entered the language mainstream. It is now a defined term although the full spelling is still some years away from acceptance and regular use in polite print media. That it makes it in the abridged version is a commentary on the state of civil discourse. In some ways, I’d rather see/hear it than the much more vile tone of this season’s political discourse. Forgive me, but I have stooped to a couple of F-bombs uttered aloud (and a few WTFs too) over my morning coffee as I read what passes for facts these days. Both sides fudge, but the award for the most consistently skewed effort goes to the Karl Rove-inspired 25-years-in-the-making attack at any cost right side. For crying out loud, if your veep choice can’t (or at worst, won’t) get his facts straight on any number of economic and environmental issues, well, my WTFs have some merit. On a softer side, and after being pilloried for holding Emma like a football, Reid recently displayed a deft touch with his niece. Nice job, kid. The U.S. Postal Service delivered this letter to Ellen and Reid last week. Ellen/Reid: Once again, I cannot close the deal on the golf course. A hopeful opening nine of 39 followed by a fingernails-on-blackboard 45 on the inward 9. It is just so totally deflating. There is no one single problem; there are lots of problems. Since I distain practice, perhaps 84 is the best that can be hoped for. But the ‘what if…’ mode of thinking keeps creeping into the picture. I hope Emma never picks up the game. No, it would be fine if she did. Gramps will need someone to play with since I will have scared off all the others by then. I’m on board to teach another college class in mid-September. I fumble a bit with the class on blogging but this time it’s on straight news/content writing which will be a little closer to my skill sets. So far the enrollment is a bit spotty but folks tend to sign up at the last minute so we’ll see. As long as the college will continue to have me, I’ll teach. Ellen, I could use some of your classroom organizational prowess. The ‘F-bomb’ has made it into the lexicon. Merriam-Webster’s dictionary has added it to the list of dictionary-able terms. Never thought I’d live to see the day. You can expect that any day now Fox News will begin to use it to attract a hipper, yet still news-dense, audience. I sent a note to Norm Goldstein, late of the AP Stylebook, about this unfortunate incident but he hasn’t said anything as of yet. We continue to lower our language civility threshold one bad word at a time, although I must confess I am a shameless abuser. Hope my glass house can withstand all the tossed stones. About the time you get this, Hurricane Isaac, or tropical storm Isaac by the time it gets here, will be dumping a lot of water on the Southeast. We need the rain but not quite as badly as you guys need it in the Midwest. There have been a ton of photos that show stunted, runty and kernel-less corn cobs in your neck of the woods. I’m afraid it is a feast-or-famine twist on global warming. You have a lot of water one day and almost no moisture the next. There’s so much hot political air swirling around in these parts you’d think the huffing and puffing would shove the storm up your way. That would be a highest-and-best use of that unfortunately renewable resource. Just read on CNN that a hiker was killed by a grizzly in Alaska. That will be fuel to the fire for next year’s hiking extravaganza no matter where we go. Makers of bear spray can’t buy this sort of advertising. What is really sad is the poor guy was taking photos up until the very last second before the attack. Now that is wild. It exhausts me just to hear about all the traveling you guys have been doing. Jeez, that’s a lot of road time. Ah, but you might as well do it while you’re young and have boundless energy. 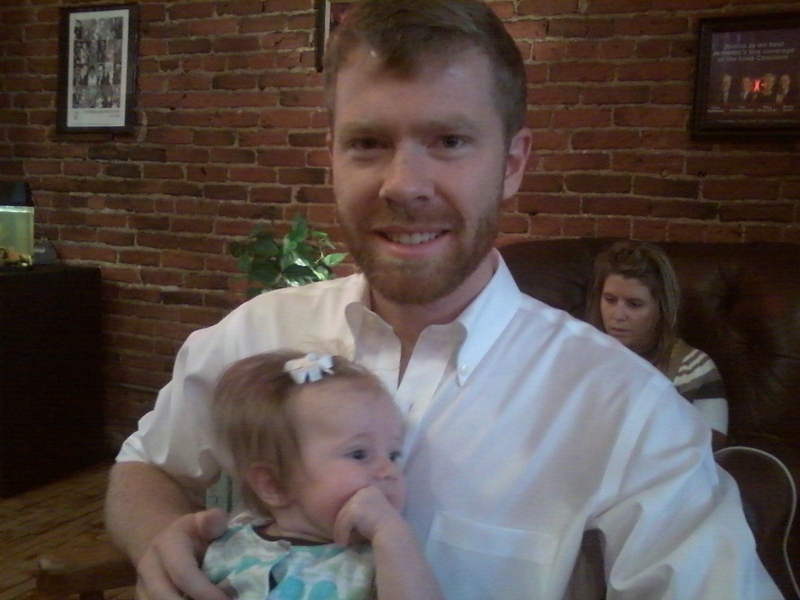 Reid, you looked entirely more comfortable holding your niece that you did when you visited Emma in Minnesota. She was even sacked out in one of the shots. My theory, however, is that every minute she sleeps during day translates to five (maybe 10?) minutes of awake (“I’m ready to play!”) time at night. Ellen, you will have to confirm that mathematical formula for me. This is a short week for me in that, unless Isaac pounds us on Thursday and Friday, I’ll tee it up on Friday with my friend Mike from the bank. There will be no end of trash talk and finger pointing with him while we play. He has steadfastly held the upper hand because he gets two strokes a side, although it’s time I knocked him off his pedestal.